JohnnyBall is a portable 3D slope and leveling system for heavy equipment like dozers, excavators, compactors, graders, scrapers, skid steers, etc. JohnnyBall allows operators to manage indicated slopes in a true 3D format and keeps operators running 100% of the time. The quick-mount design allows operators to conveniently swap it on and off machines. 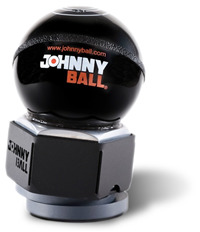 JohnnyBall is an effective training tool and also a powerful tool for heavy production. It puts all level of operators on the same team. JohnnyBall is a portable 3D slope and leveling system for heavy construction equipment like dozers, excavators, compactors, graders, scrapers, skid steers, etc. JohnnyBall allows operators to manage indicated slopes in a true 3D format and keeps operators running 100% of the time. The quick-mount design allows operators to conveniently swap it on and off machines. JohnnyBall lowers slope confirmation costs because it reduces the need for costly GPS systems on every piece of equipment, it reduces the need to set as many grade stakes, and it increases the efficiency of the operator without the need for manual grade checks. Johnnyball utilizes industry-standard 3D slope and level indicators. It’s easy-to-operate design eliminates guesswork, at a glance technology and requires no training. Operators are up and running fast with JohnnyBall’s one-step installation. Built to last, the Johnnyball is engineered to withstand the rigors of heavy-duty work. It adheres easily to glass, painted metal and plastic with 490 pounds of holding strength. Learn more about how this leveling system is saving operators time, money, and hassle at SwanaPalooza, Booth 330.